How about some muffin madness with chocolate and pistachio’s girls?! I was craving for a “muffin moment” and the recipe that came out of it is truly ah-ma-zing. These cute, light and fluffy brown handhelds are actually healthy and diet-friendly too. 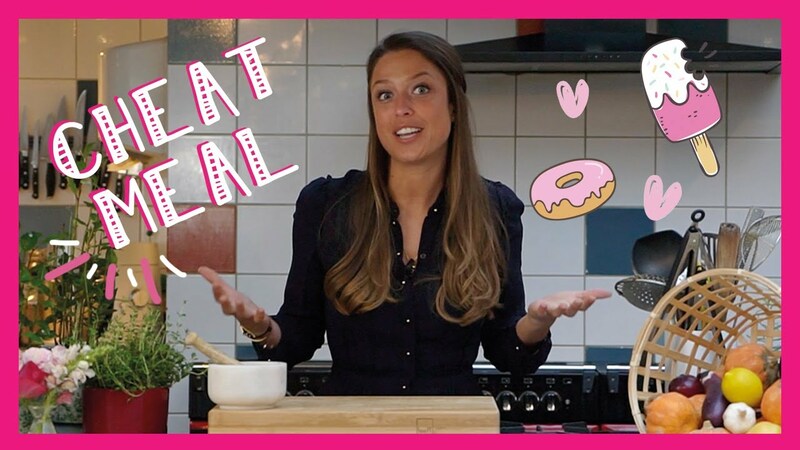 Are you ready to throw a Fit girl muffin party? I probably eat a chocolate treat every week and therefore I challenge myself each time to come up with a brand new and even more healthy choco recipe. 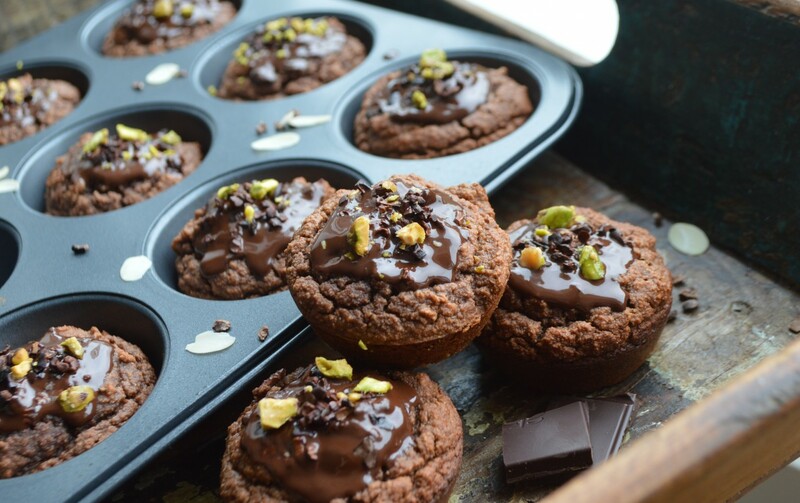 This recipe for choco-pistachio muffins is sugar-free, low fat and low in calorie. As always I like to keep my recipes simple and nutritious, which makes it easy to make and to incorporate into our bikini diet. 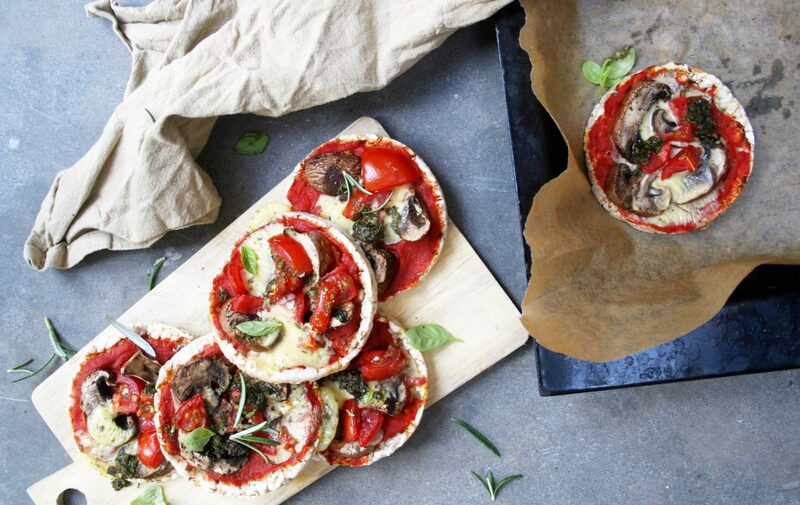 Another BIG plus of a muffin is that they are perfect at any time of the day – breakfast, snack, lunch, pre-workout or even for dinner if they’re savory! 2. Place the banana (cut in pieces), eggs, honey, coconut oil, coconut milk, coconut flour, cacao powder, baking soda and salt in a small bowl and mix till smooth well. 3. Grease a 12-cup muffin tin or line up with paper cups. Spoon the batter into the cups, filling each 2/3 of the way full. 5. Now start making the raw chocolate topping once the muffins are almost ready.Place (melted) coconut oil and maple syrup in a bowl and mix them. Add the raw cacao powder and stir until the chocolate mixture is smooth. 6. Put some of the chocolate mixture on a muffin and continue with adding the crumbled pistachio’s and shredded almonds as well. Feeling tired? 3 tips to get your energy boosted! Have you tried freezing these muffins and were they ok defrosted? Actually I don’t have to much in my freezer, as I always give away my baking stuff to my parents, friends, neighbors and..my boyfriends takes the (eating)lead ha ha! Is the mixture supposed to be this liquid? I’m getting a little worried. In plaats van Cocos meel amandel meel gebruikt. ..omdat mijn supermarkt het niet verkocht. Niet geroerd maar de staafmixer gebruikt en uitgeschoten met het zout. Geen keuken prinses. Volgende week ga ik je cheese cake proberen. Hopelijk dan meer succes! Succes met de taart, dit is een no-bake receptje dus dat is al makkelijker! Hou je me op de hoogte? Leuk! Pam it is. Celery root acts like a root vegetable it smlles like celery but the taste is different (sweeter but still celery like) and isn’t stringy. They are ugly for sure and most people pass them by when shopping (usually kept near the ginger, horseradish, etc.) but they are worth the bit of effort to cut the skin off. I usually will boil or roast mine. Ty are great in a mash I will be posting a recipe this week if how I use them in mashed potatoes as a Thanksgiving recipe.